Hi guys ! Hope you're all well ! I've started participating in the challenges that Séverine from the Facebook group Monday Shadow Challenge proposes each week. Every monday, she proposes a color and you can publish a makeup look based on this color if you feel like it. 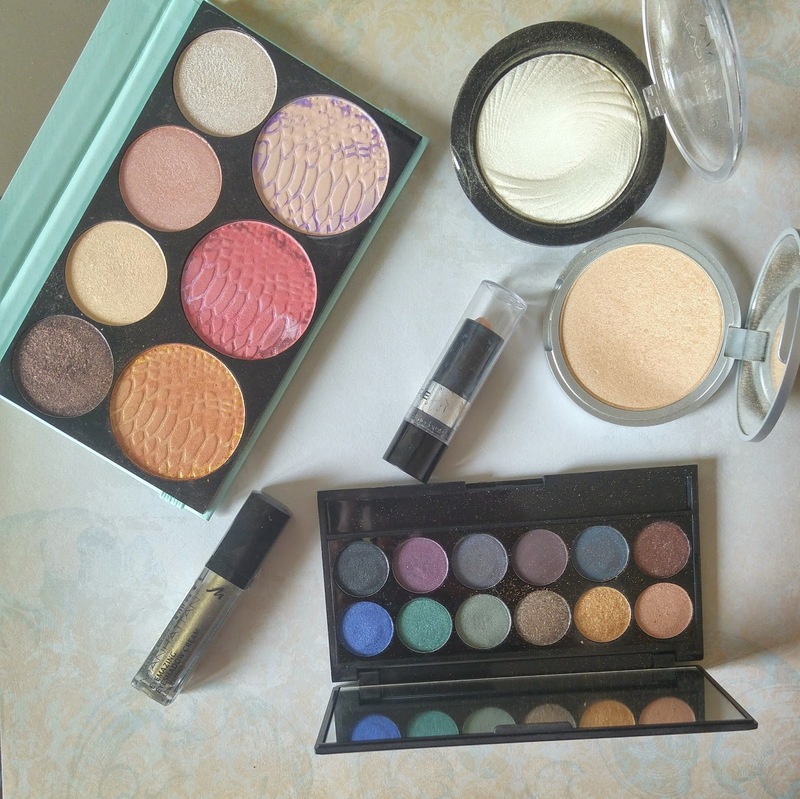 It can be used as an everyday look or as part of an artistic makeup. This week, we had to work with gold. 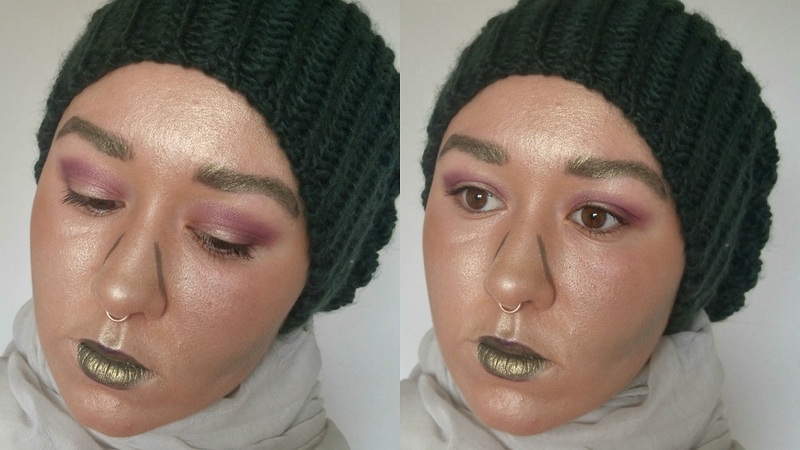 I had much fun using this color to create an artistic, futuristic, tribal makeup that one cannot possibly wear during daytime. 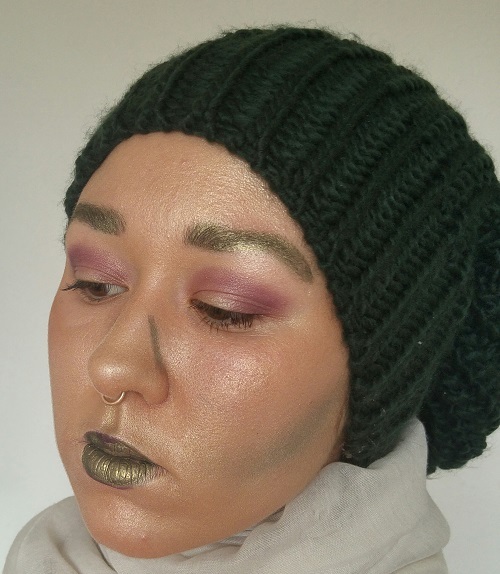 I was inspired by several things for this makeup look : army clothing, the Capitol fashion from the Hunger Games movies (Effie Trinket, anyone ? ), the Charlie and the Chocolate Factory Oompa Loompa (from the 1970s movies everyone !) and the statue-like men in touristic cities. The result is really science-fiction like and I can imagine a woman wearing this look with white, avant-gardiste, geometric clothes for a runway for instance. I have used few products for this look. 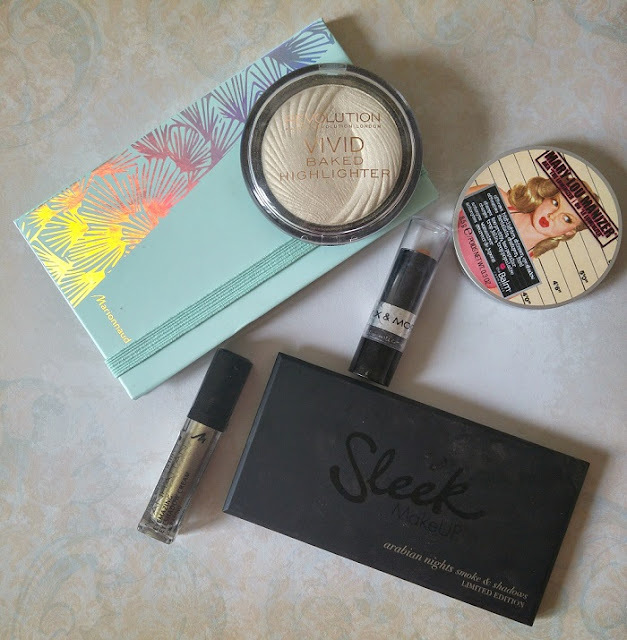 I hydrated my faceskin and then powdered it with the The Balm Mary-Lou Manizer and MUR Vivid Baked Highlighter in Golden Lights highlighters. 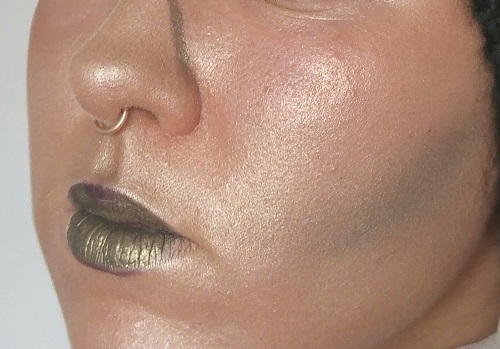 I wanted a different contouring effect so I used the golden blush from the Color Booklet of Marionnaud that I showed you here and that you can still try to win until February 29th noon GMT+1 ! 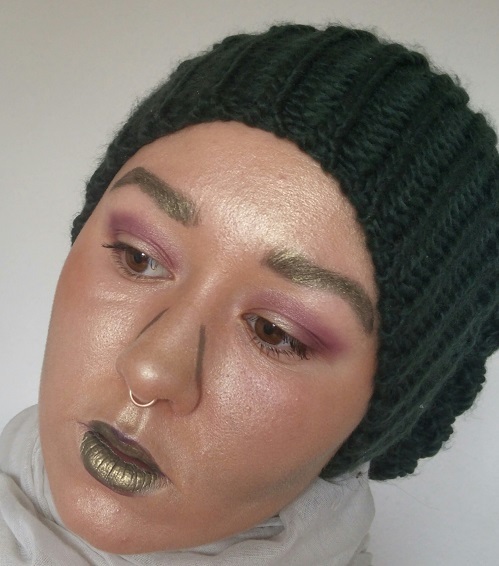 I wanted an even weirder look so I used the Manhattan Eyemazing Longlasting eyeshadow cream in Khaki Paradise. I blended it a bit under my cheekbones but I left it as such on the sides of my nose so I would achieve a kind of warrior, tribal effect. To unify it all, I applied one more layer of Mary-Lou Manizer that has excellent coverage as well as being very bright. After I applied a thick layer of lipbalm, I applied a Max & More Light Beige concealer so as to make my lips "disappear". Then I also applied Mary-Lou Manizer highlighter on them as well. 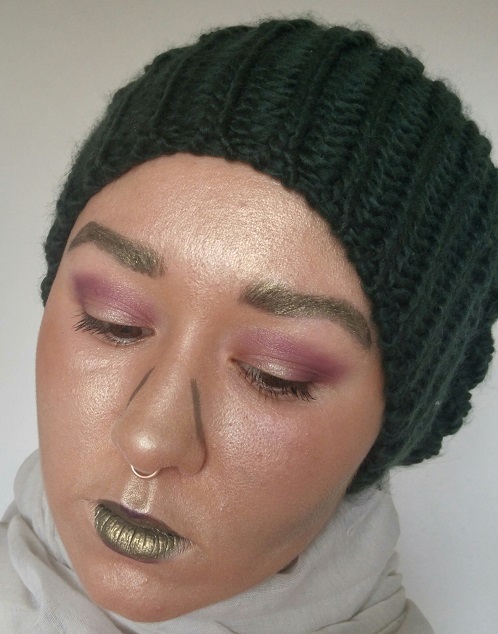 I created a Capitol-like small mouth with the same Manhattan Eyemazing Eyeshadow and I liplined the middle top and bottom of my mouth with the Sleek Arabian Nights Valley of Diamonds purple eyeshadow. I brushed my eyebrows and I applied the Manhattan Eyemazing Eyeshadow on them as well. I exaggerated them so as to get a geometric, harsh look. The makeup on my eyes is easy : I only took the purple eyeshadow Valley of Diamonds from the Sleek Arabian Nights palette and I blended it high above the eyelid crease. I blended it down to the inner corner but I left a part of my eyeshadow with but the golden color. I finished my eyelook with two layers of the Makeup Professional Fat Lash Fiber which is a dupe of the famous Younique mascara. I did get harsh comments for this look : "perturbating", "awful", "OMG what IS this ?!". It's designed to be artistic and eye-catching, not necessarily beautiful. I love creating different, weird looks, tell me what you think about it down in the comments ! Do you like this look ?